Underground Cardio Party: One week only! Some work days just make you feel like doing a flash dance when you get home to shake off the stress and yet Tuesdays aren’t huge clubbing nights. Next week (May 9th-14th), however, our disco ball dreams can come true. 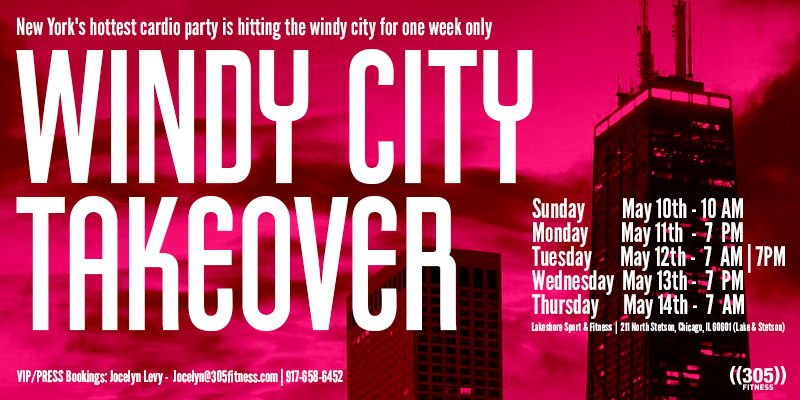 ((305)) Fitness, New York’s trendiest underground dance fitness party is coming to Chicago. Imagined and created by Brown graduate, Sadie Kurzban, ((305)) Fitness combines the fiesta atmosphere of clubs (dark lighting, live DJs, flashing lights) with high powered dance moves, interval training and sport training elements. Sadie will lead all the classes. SO why try ((305)) dance fitness? Dancing makes you smarter-not only does mixing up your fitness routine challenge your muscles but dancing activates your brain! Don’t want to go it alone? Come join us on Tuesday, May 12th at 7 pm (legwarmers and zebra print yoga pants encouraged!) or pick from one of 6 classes offered next week! Don’t miss a chance to get sweaty and friendly with your fellow Chicagoans. Classes take place at 211 North Stetson, Chicago.